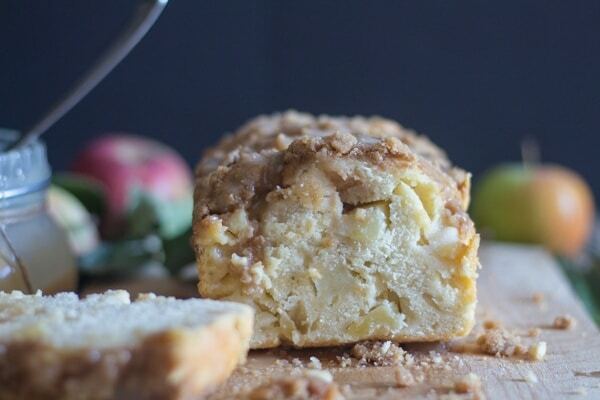 A delicious moist Apple Crumb Bread, perfect anytime. Snack, Dessert or even Breakfast. Serve plain or with a drizzle of Homemade Maple Caramel Sauce. It’s finally apple season and I couldn’t be happier. I must have tested this Apple Bread Recipe at least half a dozen times. I had a lot of taste testers for this recipe which means a lot of critics! I messed around with the amount of apples I used, how big or small I chopped the apples, but never the type of apple. Be sure to watch the Video! I have to say for Baking or Cooking Apples, I always reach for a Royal Gala or Fuji. My favourites not only for baking or cooking but also for eating. I also used Cake flour rather than all purpose. 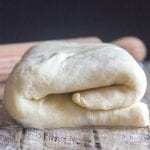 Cake flour makes a tender and delicate texture. And no need to buy, just make your own. For every cup of all purpose flour remove 2 tablespoons of flour and substitute with corn starch. Be sure to sift together two or three times so it is well combined and has no lumps. 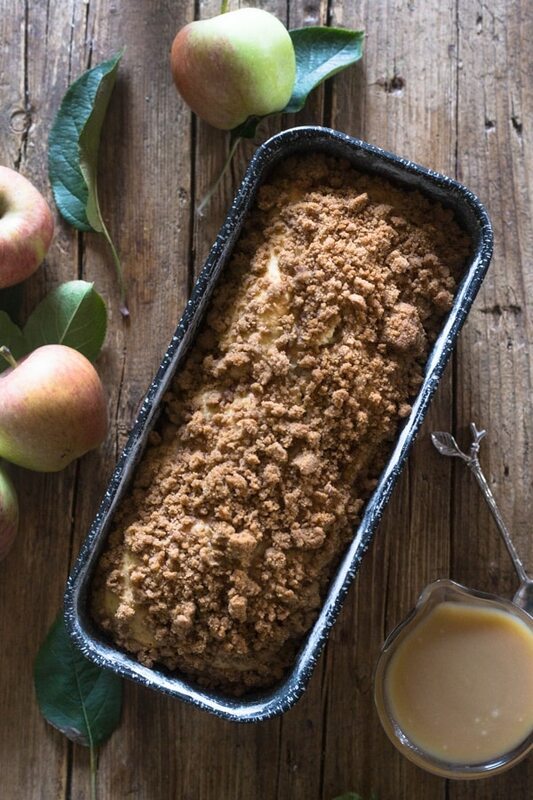 Yesterday I shared my recipe for Maple Caramel Sauce, so naturally I had to add a drizzle to the cooled baked Apple Crumb Bread, and yes it was the perfect finishing touch. 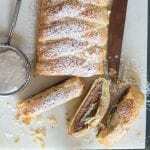 More Apple Recipes you may enjoy! 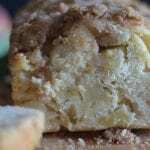 So if you are looking for an Apple Bread with all the trimmings, then this is the one! 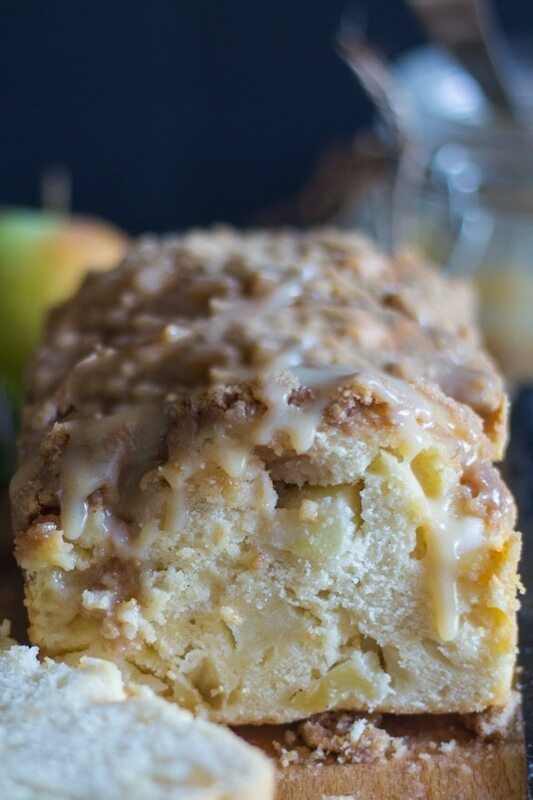 Lots of chopped apples, a crumb topping, a little cinnamon and a creamy Caramel Drizzle. Enjoy! And Happy Thanksgiving to all my Canadian Readers. I am definitely looking forward to this Thanksgiving. Roast turkey and all the trimmings with my Canadian Family for the first time in 21 years! 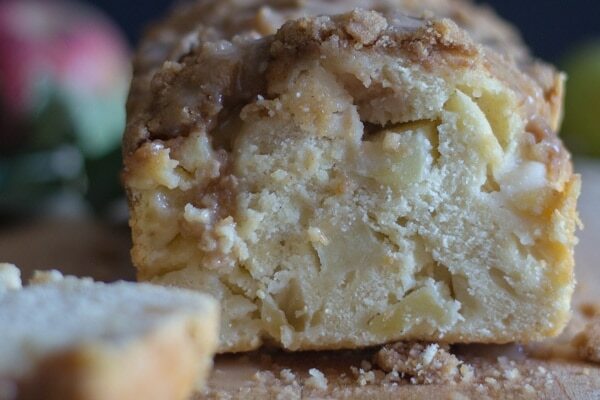 A delicious moist Apple Crumb Bread, perfect anytime. Serve plain or with a drizzle of Homemade Maple Caramel Sauce. 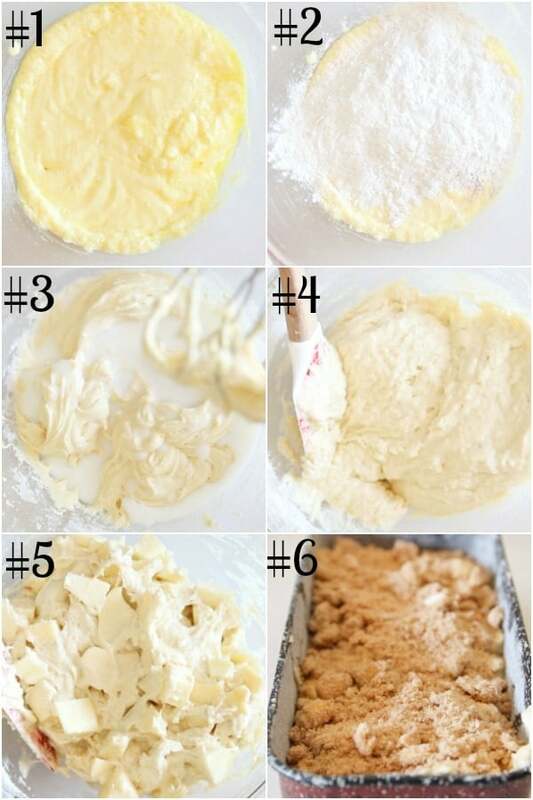 **Homemade Cake Flour - for every 1 cup of all purpose flour remove 2 tablespoons of flour and replace with 2 tablespoons of corn starch, sift 2-3 times to combine well. Room temperature - remove from fridge 30 minutes before using. Pre-heat oven to 350F (180C), grease and flour an 8 inch loaf pan. Chop apples (small or medium size depending on what you like) and stir in 1 tablespoon of lemon juice - keeps the apples from turning brown) and set aside. 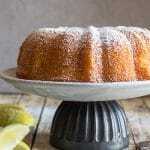 In a medium bowl whisk together the cake flour, baking powder, salt and cinnamon. Set aside. In a large bowl on medium speed cream the butter and sugar, approximately 2-3 minutes, add the egg and continue beating until fluffy for approximately 4-5 minutes. Beat the dry ingredients alternately with the milk into the egg mixture (beating between each addition). Fold the chopped apples into the batter. Spoon the batter into the prepared loaf pan and sprinkle with the crumb topping. Bake for approximately 40-45 minutes or until tooth pick comes out clean. Let cool completely before drizzling with Maple Caramel Sauce. In a small bowl mix together the cinnamon, flour and sugar, cut in the butter until you have coarse crumbs. Sprinkle on loaf before baking. Did you make this recipe?Mention @anitalianinmykitchen or tag #anitalianinmykitchen! Join our mailing list to receive the latest recipes from An Italian In My Kitchen. Hi, I tried this recipe today and the flavor is perfect! However my loaf is extremely moist and dense, no crumbs or air holes. It doesn’t look like your picture! I actually baked it about 10-15 minutes longer because the toothpick kept coming out wet at 40-45 minutes. I followed the other directions to the letter but I’m wondering if the quantity of apples or the size of the dice could have caused it. Do you know how many cups of apples is best? My two apples were pretty large. 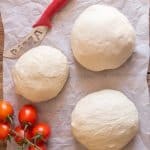 I really want to save this recipe, flavor-wise the best I’ve tried! Hi Elaine, the first time I made this bread it came out the same way yours did, and yes that is because of the amount of apples (I think I used 3 medium apples the first time and 2 the 2nd time) my family loved it that way but I prefer less apples and diced smaller. So I would say if your apples are very large then probably 1 – 1 1/2 would work better. Hope that helps. Let me know. Have a wonderful Sunday. Question – you say to put your chopped apples into lemon juice to keep them from being discolored…so then do you drain the lemon juice from the apples before adding the apples to the batter, or just add the lemon juice to the batter? Thanks! So glad I found you.